This Is Our Brand New Traditional Style Rectangular TV Trays That Are Made Of Solid Wood And Finished In The Antique Walnut Stain.One Set Comes With Four Tables .It Is Large Enough To Be Used For Serving A Meal Or Snack, Working On Paperwork Or Laptops. 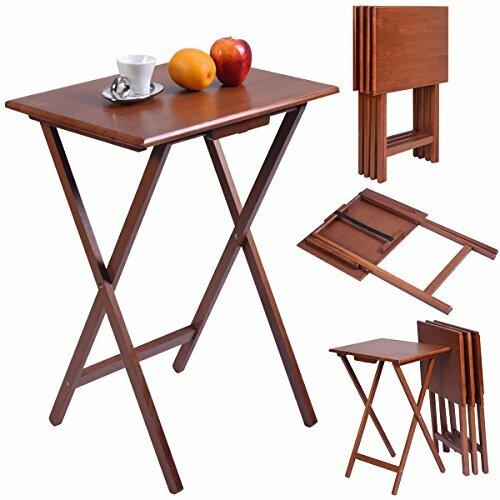 The Legs Feature An Elegant X-Design And Fold Together Easily For Quick And Easy Storage. The Tray Table Set Is The Perfect Addition To Your Home And Decor. Don't Hesitate To Buy From Our Store Now! Lipper International 801 Bamboo Wood Lipped Snack Tables, 20" x 15" x 25.5"